In this Siteturner round-up, we take a close look at the best WordPress business directory themes available for 2019. 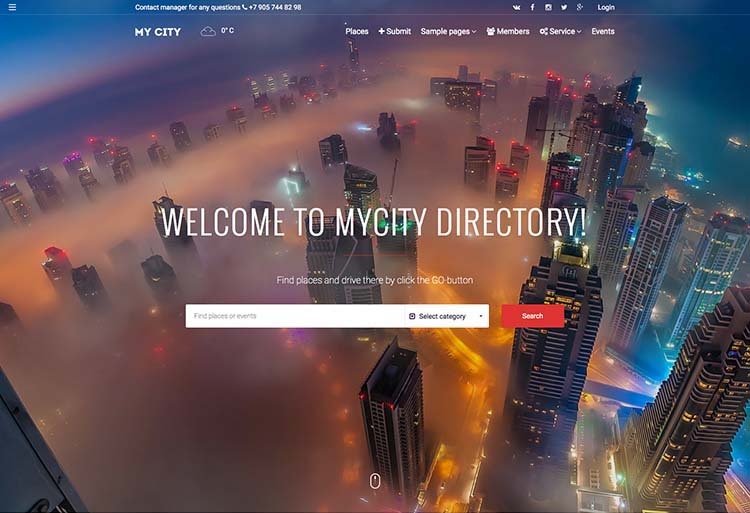 Any one of these themes would work well for building a city guide, local business directory, or even a global directory on the WordPress platform. As far as we can tell, the only must-have features for a WordPress city guide or business directory is the ability to submit detailed listings, and a page template to display them. Beyond that, it depends on your individual requirements. Obviously Google maps and geolocation support are coveted features. But we also think that most users would benefit from front-end dashboards for listing submission and management, and so many of the themes featured on this list do provide front-end administration. We also know that anyone looking to build a business directory, local or global, probably has money in mind. In that case, make sure you select a theme that integrates at least one payment gateway and membership plan. As always, we feel it necessary to point out that the themes on this list were selected by hand, based on the quality of their design and the depth of the functionality they provide. We did not simply gather up every WordPress business directory and city guide theme on the internet and spit them out onto the page. There is a loose order here, in that the first theme on the list is our favorite, while the last theme on the list is our least favorite. But all selected themes are high quality, and any one would make a good starting point for your city guide or business directory website. If you think we missed something, send us a link and we’ll check it out. First up, we’ve got the fantastic DirectoryEngine theme by EngineThemes. DirectoryEngine features a modular design with a fully supported page builder, giving site admins lots of control over the way information will be presented to site visitors. The theme is essentially an assembly of content blocks that display reviews, categories, testimonials, featured places and more. Users can quickly and easily submit their place listings, and with DirectoryEngine you can monetize your website by selling paid listing plans. The developer is constantly updating the theme with new features. Most recently, support for events listings has been added. The professional, understated flat design and the full range of features make this the strongest theme on our list. In fact, it’s really more of a total solution for a directory site than it is a theme. It won’t require any coding knowledge whatsoever, and it’s unlikely you’ll need anything else. Detailed documentation is included. EngineThemes provides one of the most detail breakdowns of functionality you could ask for, and if you’ve got a few minutes we’d suggest checking it out. Highly recommended. Buzzler is a feature filled theme that has won countless awards. The theme is designed to help you start making money immediately on your directory site, while being easy to install and use. What’s really cool about Buzzler is its comprehensive admin functionality, which lets you do all sorts of things, from setting design parameters and choosing skins and colors, to setting up monetization, and complex payment functionality. Buzzler integrates directly with BuddyPress, allowing you to create a Yelp-like site quickly and easily. For monetization, Buzzler allows you to charge for membership, charge by posting, have featured listings, advertisements, and more. It has all of the other functionality you would expect in an excellent directory theme, including social media integration, SEO features, and deep maps integration. We don’t love some of the design, and the logos out of the box, but with a few tweaks in the admin tool, you can make your site look amazing. What Buzzler really excels in, however, is its customizability and administrative features. We strongly recommend that you check it out. 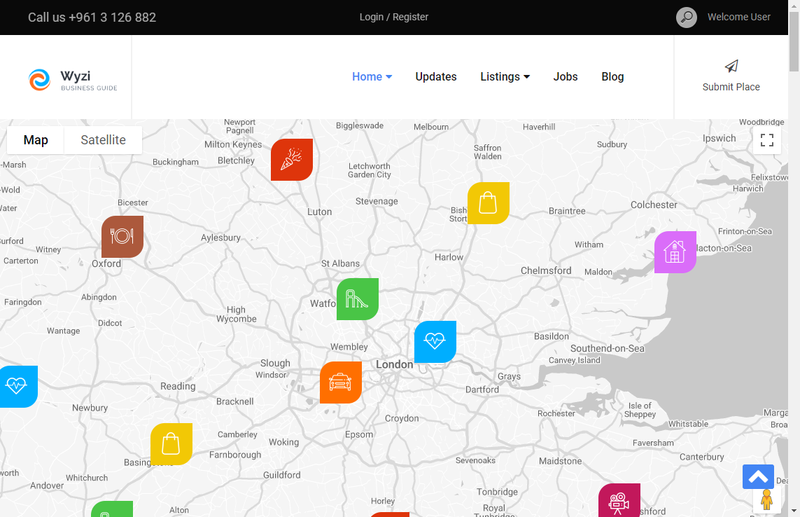 Next up we have the My City directory theme, released in October. First, I need to mention the gorgeous, full-screen animated background the design team used for the demo. As expertly designed as the theme is in general, it’d be hard to top the first impression made by its demo, unless you have a similarly vibrant rendering of your own city/town. This graphic deserves a closer look if you’ve got the time. The subtle, animated fog is very cool. The rest of the design is almost as lovely, and the developers have embraced a familiar, one-page style UX, using modern trends and techniques. The result is a product that’s visual engaging without creating noise and distraction. It’s flashy and fun, but that eye-candy doesn’t overshadow the content. Usability and performance deserve a nod, too: it’s speedy, and the sensible navigation and architecture are a pleasure. Features are impressive, and it’s clear the team knows you’re not putting together a city directory just for fun. Lots of emphasis is placed on monetization efforts. With MyCity, webmasters can charge local business for premium listings, or even setup a subscription/membership model. Affiliates will appreciate marketing tools like shareable coupons. Of course, all the necessary functionality for building the directory itself is included. Google Maps and Geolocation are fully supported. Strong secondary features add even more value: premium plugins like Visual Composer and Slider Revolution are bundled free. EventOn and Testimonials showcase extend functionality further. Plenty of settings and options are packed into the admin, so adjustments, customization, and branding are a simple process. Combined with Visual Composer’s drag & drop page building, digging into the code itself to change things around will never be necessary. My City is SEO optimized, to help you secure excellent rankings in Google, and it’s built responsive on Twitter Bootstrap (for flawless display and usability across the range of mobile gizmos). Amazingly, it’s currently priced at the low price of $59. This is a bit perplexing, considering the strength of the product and how much obvious care and time went into getting it just right. Other ThemeForest products with half the features of My City – and lesser design quality – are often priced at least 10 dollars higher. Weird. Anyway, we couldn’t even begin to cover everything the theme offers, so take a peep at the details page for the full scoop. And check out the demo! 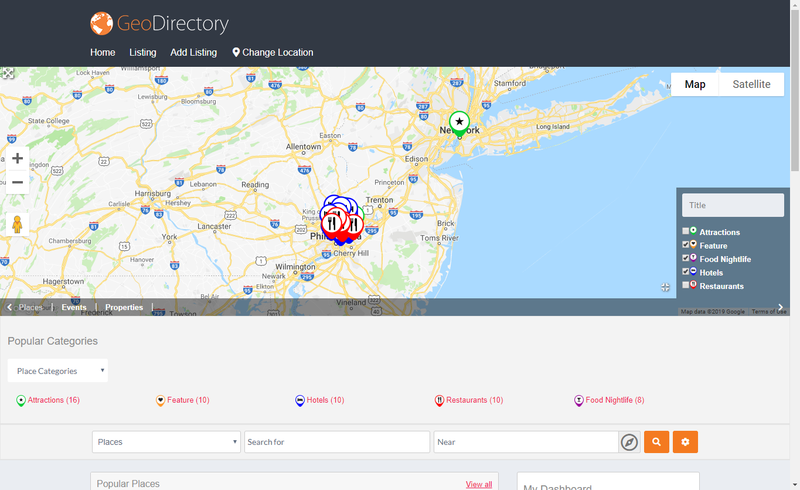 GeoDirectory is more than just a theme, it’s an entire package of themes, plugins, and addons which can be used to set up any type of directory site you want. Although the base GeoDirectory plugin is free, it’s not very useful unless you add the themes and addons available for sale from the GeoDirectory website. However, once you do get the themes and addons, you can do nearly anything with this package. The base plugin gives you the ability to manage locations. 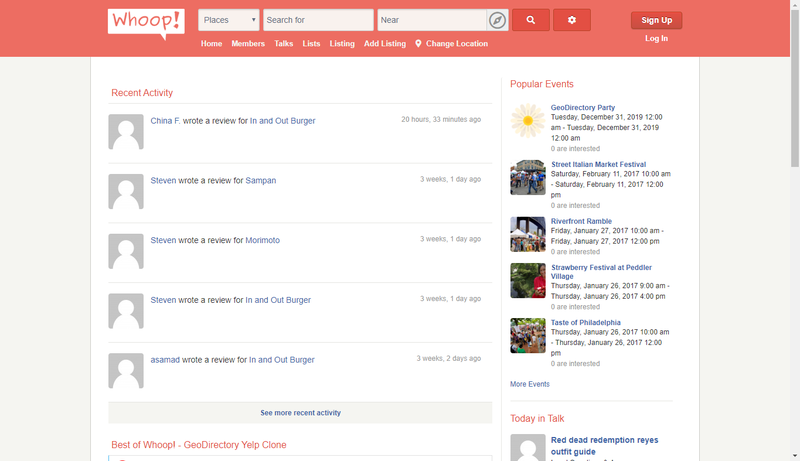 With the addons, GeoDirectory has everything you need to build nearly any directory-based social site on the Internet. Features include many forms of monetization, built in payment gateway connectivity, an event manager, affiliate integration, BuddyPress integration, and more. This package is constantly updated and has a large developer community. There is an API so it’s easy to tailor GeoDirectory to do anything you want to do. If you register as a member, you get any new plugins and addons, as well as updates and support. Looking to create a Yelp-like review site? 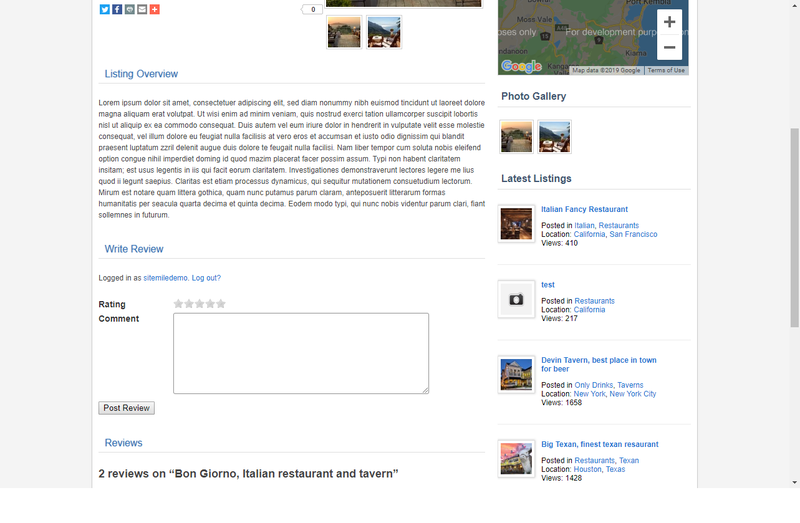 GeoDirectory configured with the Whoop theme allows you to do Yelp better than any clone we’ve seen. 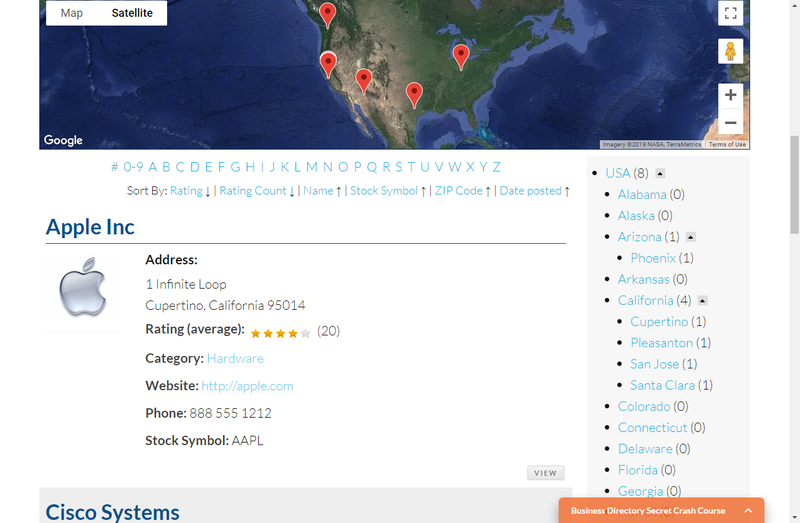 Supreme is a hotel/business search theme for GeoDirectory that looks great has a ton of features. 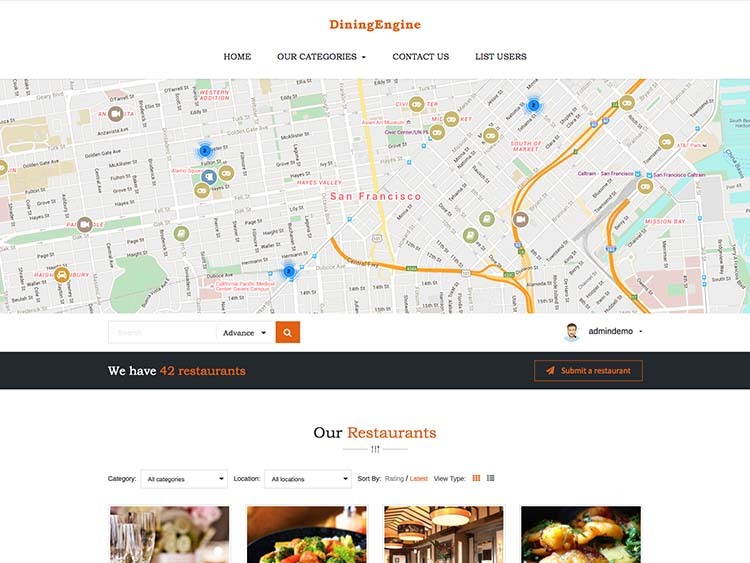 I hesitated to follow-up DirectoryEngine with DiningEngine (partly because of its very specific intended purpose), but DiningEngine such a strong product that it deserves a top spot on the list. So what the hell. If you’re looking for something more general, or if you’re concerned that we’re nothing but soulless shills for EngineThemes, feel free to skip ahead to the next pick. We really do just love their stuff. 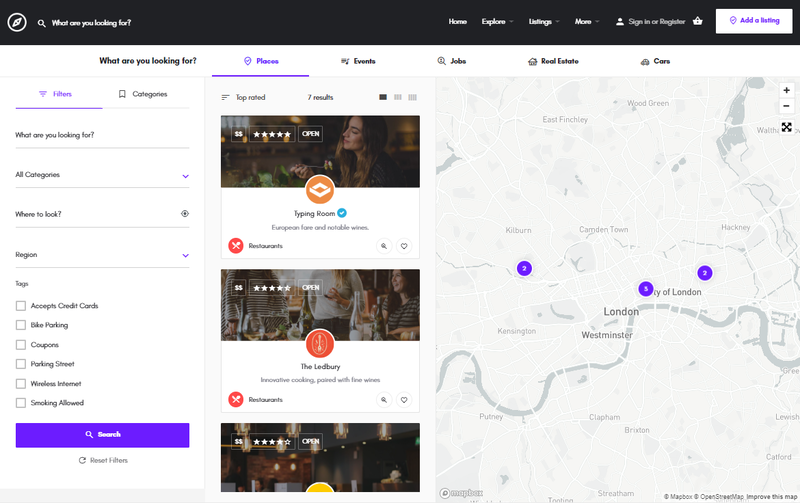 Simply put, this highly intuitive, expertly conceived, and impressively executed product is about as good as it’s going to get if you want to build a local restaurant directory on the WordPress platform and skip paying for expensive custom solutions. Absolutely all the functionality you need is provided right of the box, including options for monetization (payment plans, payment gateways, etc.). The UX is top-of-the-line, and the design is sleek & modern with its own personality (without being obtrusive, gimmick-ridden or over-baked). Have a closer look and you’ll see what we’re talking about. Cool? Cool. Next, we have an excellent, full-featured theme called Vantage. This is a fully-responsive theme that works great on mobile. 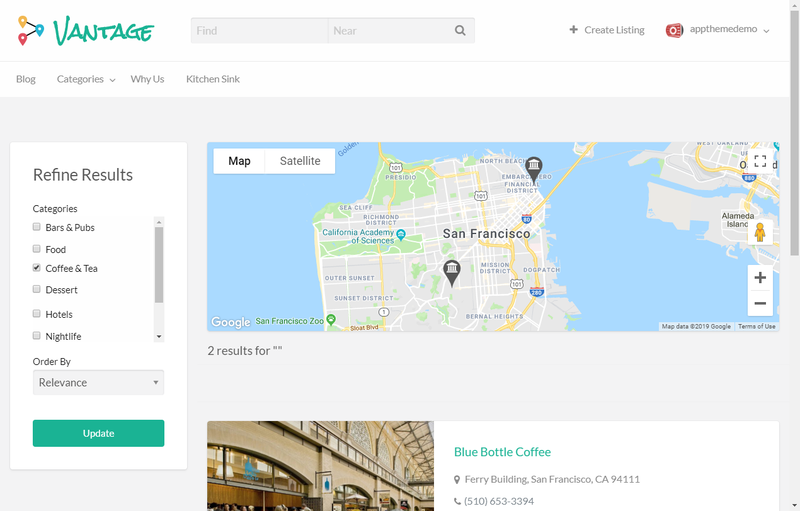 Like any good directory theme, front-end pages are provided for submission and management of business listings, and it’s fully integrated with Google Maps w/ AJAX. There are also bulk upload options included, in case you’re migrating listings from one site to another. This theme is designed around monetization, with multiple methods built right in. It allows businesses to come in and claim listings as their own, with plenty of editing options. Also included, SEO friendly features, social media integration, and a review engine. For developers, there’s also a cool API that allows you to do all sorts of modifications without editing the theme code. This is an excellent feature that can be really useful. Vantage has a huge installed base, with lots of support available, so no matter what your level of expertise, you will never have a problem getting this one up and running. Vantage is definitely worth a look. Listingo is a great business directory theme that gets excellent reviews from users. What sets it apart from other themes on this list, however, is the fact that it includes multiple variations of the theme for different industries. Additionally, Listingo includes monetization functionality, a booking feature, and Q&A. Of course, it also includes the standard functions you would expect in a directory, such as Google mapping and geo search, postings, and reviews. Some of the included plugins are multiple page builders, and an appointment manager. This plugin also has an importer module and a one-click import. Okay…this one’s not exactly a theme, but it provides all of the functionality you need for your business directory…plus a whole lot more. 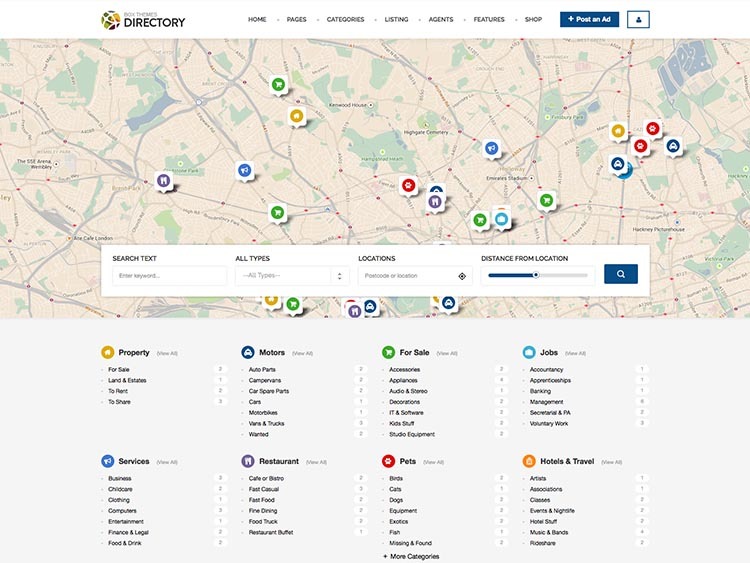 If you want to have your own look and feel — or if there’s a certain theme that you want to use for your site that doesn’t include business directory features, the Business Directory Plugin is for you. 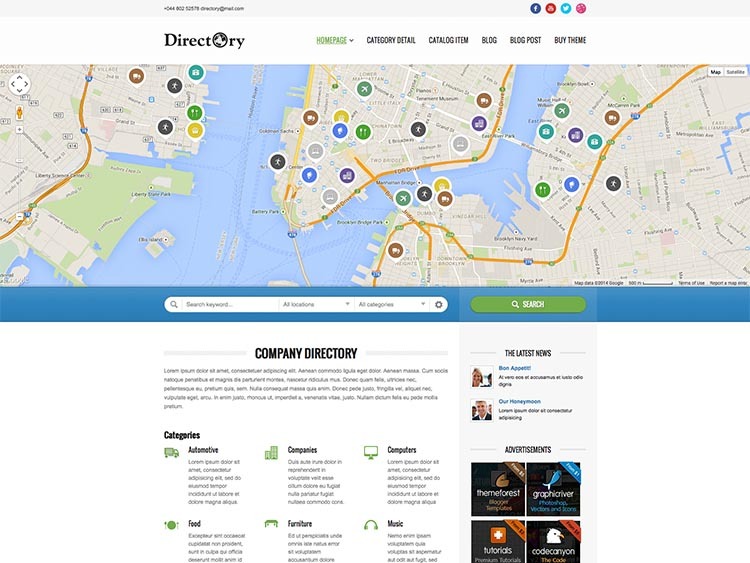 Business Directory Plugin provides all of the monetization, mapping and geolocation, and search/review functionality that you need for your directory. It also has many admin tools and import functions, if you are pulling your data from a different place. This plugin is highly reviewed, and it has a large user base, so you’ll always be able to find answers to your questions. Another great thing about Business Directory Plugin is that the base plugin is free, although you will have to purchase some of the additional modules to make the feature set compare with the other options on this page. We recommend taking a look at this plugin if you are planning to build a custom designed theme for your site, or if none of the themes on this page have the look-and-feel you are looking for. Just remember, you may need to do some customization in order to get your theme to work with this plugin (but you can get it done for pretty cheap). 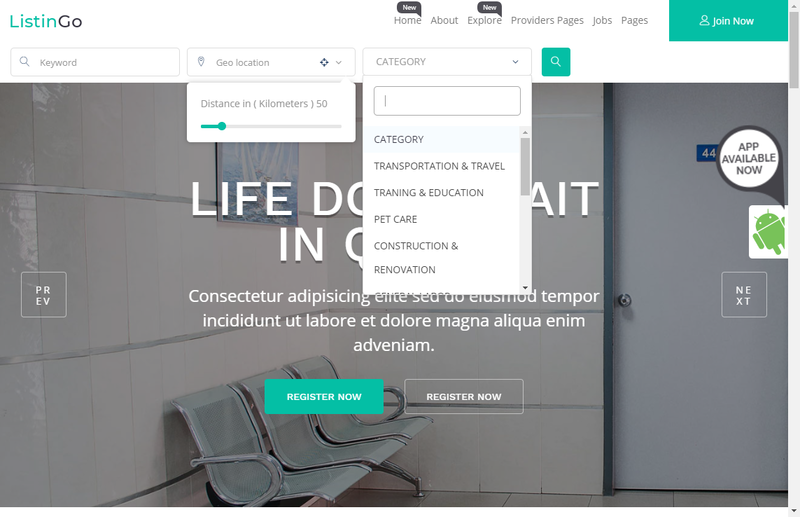 The imaginatively-titled Directory theme by Chimpstudio is an excellent option for web development agencies using WordPress to create client websites. 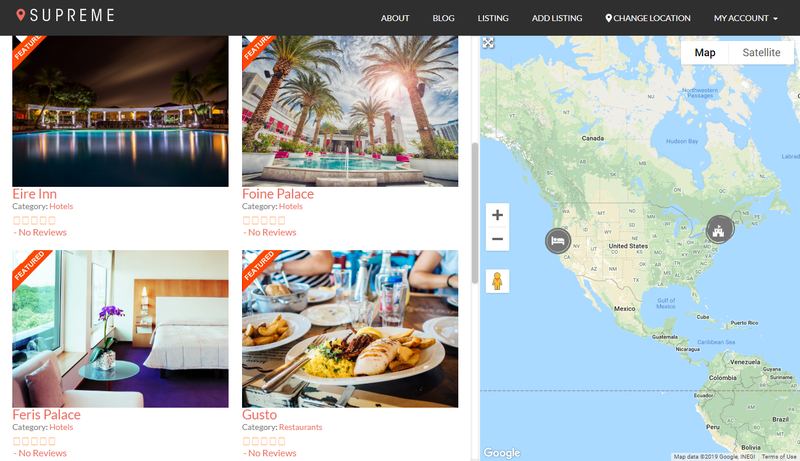 More than just a directory theme, it’s a multipurpose theme that will work for property listings, car dealers, tourist agencies, hotels, schools, job boards and more. Everything feature you need to build a local or global directory is provided. Site owners looking to monetize their site can charge users to post their listings, or go with a free listing model. 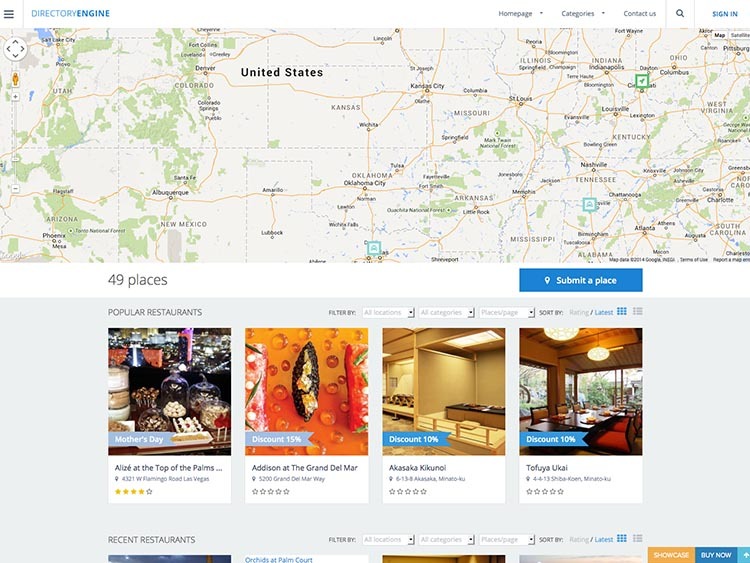 Advanced, location-based searching and unlimited categories are supported. Other notable features include Revolution Slider, packaged free of charge, an easy to use drag & drop page builder for creating and editing complex layouts, and lots of back-end settings that allow users to tweak various elements of theme – colors, fonts, and more. Directory is SEO-optimized and supports the WPML plugin. Though its clean, modern and flat design doesn’t disappoint, Pointfinder probably isn’t the flashiest theme on our list, but it’s certainly one of the most featured-packed and functional. 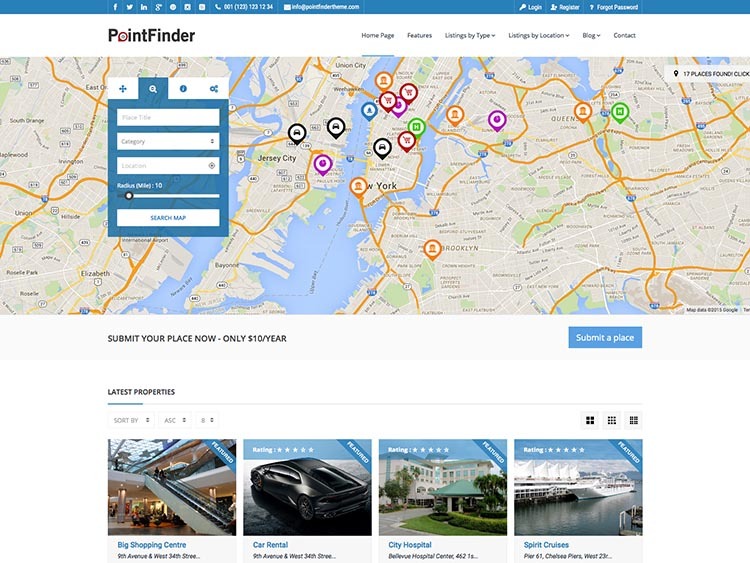 The list of directory-related features Pointfinder serves up is too long to cover in a couple paragraphs, but front-end submissions, PayPal integration, customizable content types and search fields, a review system, geolocation, and AJAX-enabled searching are among the highlights. The theme also comes with skins for automotive and real estate listings. Visual Composer and Revolution Slider are bundled free, and Pointfinder is SEO friendly and translation ready. Worth a closer look. Wyzi is another great theme, which offers plenty of look and feel options so you’re guaranteed to get your site looking the way you want. We picked Wyzi for this list because of its high quality: among users, it’s very highly reviewed. The major selling points of Wyzi are that it includes plugins, provides built in search, has many customization options, is SEO optimized, has map integration, has a drag and drop builder, supports WooCommerce, has a 1-click install process, offers multiple color choices, is skinable, integrates with social media, and offers free suppport. Some of the things that come with Wyzi are icons, background images, fonts, custom widgets, and demos. This theme is easy to set up although it might take experience to fully master. Wyzi has a large user base, so it is quick and easy to find help and support. Wyzi works well on tablets and mobile devices. It is also multilingual. The drawback Wyzi is that it is has many options, possibly making configuration complicated. Nevertheless, this theme is a perfect option for you to try. Javo Directory is a new, top-of-the-line business directory theme built on the responsive Twitter Bootstrap 3 framework. Its elegant, minimalistic and retina-ready design looks just as good on mobile devices as it does on desktops, and no functionality is sacrificed when viewed on a tablet or smartphone. The advanced search function is front-and-center on the homepage, and the theme provides multiple ways to lay out and feature your content and listings. Customizable listing pages and a customizable ratings system are included. Javo Directory supports Google Maps Pro+ w/ AJAX, and four front-end forms from which users can submit their information and listings. The theme comes with PayPal integration if you want to shake down your users for their hard earned cash, and it’s bundled with Revolution Slider and Visual Composer (for drag & drop page building). And here’s a nice bonus: the developer offers a free installation service. So if you’re new to WordPress, or just careless, you don’t have to worry about screwing anything up! Hooray! 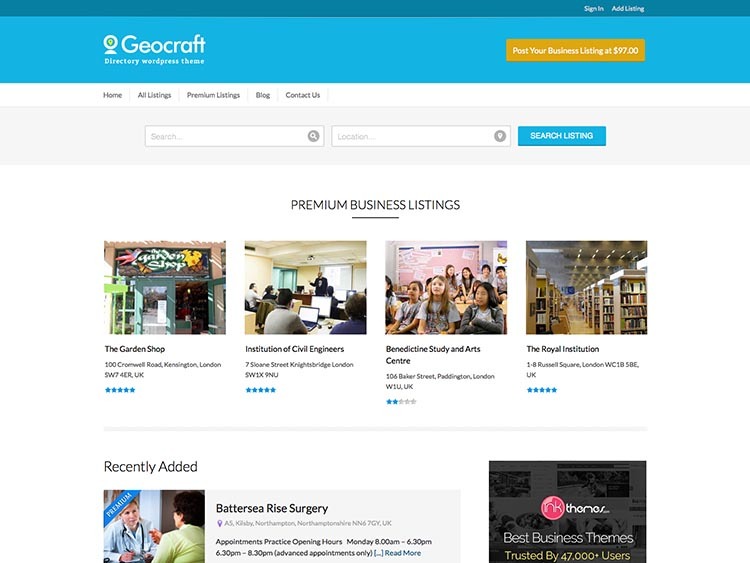 Geocraft v2, by InkThemes, is a fully-featured business directory or WordPress city guide theme that goes well beyond its clean, understated design. It has a sharp focus on monetization, and it’s optimized for generating passive income. Members can submit, manage, and pay for listings easily using the built-in listing system. The theme additionally includes a lead capture system to provide extra value to your members/clients. The theme is responsive, and comes with multiple color scheme options. A few bonuses are bundled in, too, like the useful InfoBar Plugin and a selection of PSD promotional banners to assist you in your marketing efforts. This is a simple, straight-forward theme and a good choice if you don’t want to spend time fooling around with page builders and giant options panels. Install it, promote it, and make money! It’s that easy, right? Sure! This rather lovely theme is one of the best selling WordPress directory themes out there, with almost 4000 customers. Like most themes on this list, it’s got the basics you need to build your city guide or directory, like Google maps and Geolocation support, a front-end admin for submitting and managing listings, and PayPal integration. The interactive AJAX search means users won’t be left hanging when filtering listings and sorting results. Site owners can, without much fuss, set up payment plans and fees to squeeze money out of poor local business men, or they can take advantage of the pre-made advertising spaces to earn money from Adsense or other Ad networks. The theme is responsive, SEO ready and includes lots and lots of customization options. There are some drawbacks to this theme, however. Testers have noticed some small bugs, which may keep your installation and setup from running smoothly. Also, a lot of the best features are now in plugins, which means you’ll have to pay extra for some stuff. 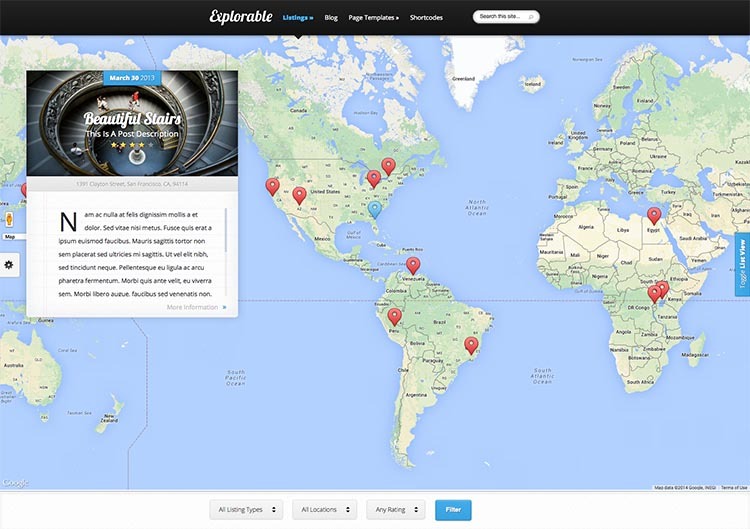 Explorable is another full-screen theme that uses Google Maps to its full potential. It’s an ElegantThemes product, and although we are an ElegantThemes affiliate, we wouldn’t include it here if it didn’t belong. Come on, you can trust us. It’s responsive, and includes a lot of useful shortcodes and page templates. The ePanel theme options give you plenty of control over the bits and pieces of the theme, meaning you can toggle elements on and off and swap colors painlessly. Buy it. Buy it now. MyListing is a fully updated theme with an excellent look and great reviews — a nice option if you’re looking for something less high-end than some of the themes listed earlier. This theme is fully refreshed, with new designs of almost all of its pages, and some great original features. For example, it includes a full analytics suite, although you basically get the same features you would get in Google Analytics. Other things it includes are a page builder (like most of the other themes here), multiple example designs, plenty of custom data types for your directory listings. Many of our users have noticed how clean and well-coded this theme is, and how quickly it loads. It also works great on mobile. The only drawback is that included support is only 6 months, which is less than some of the other themes we looked at. 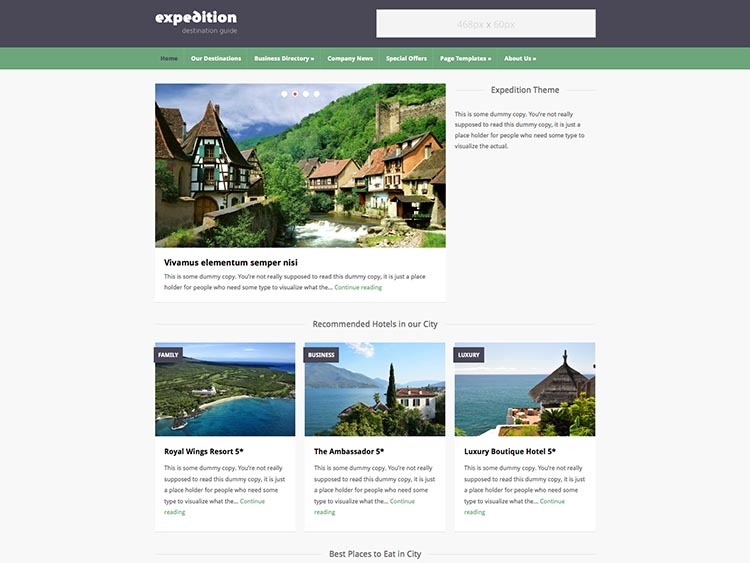 The Expedition theme by WPZOOM is a bit different than our other selections, in that it doesn’t include a front-and-center implementation of Google maps. But it’s a great option for a WordPress city guide theme or even a general travel guide regardless. With Expedition, you can create a faster, user friendly site. Expedition’s clean, simple design is built on top the advanced ZOOM framework, which offers a ton of customization potential. It’s responsive, and comes with a homepage builder and built-in banner management for easy monetization. 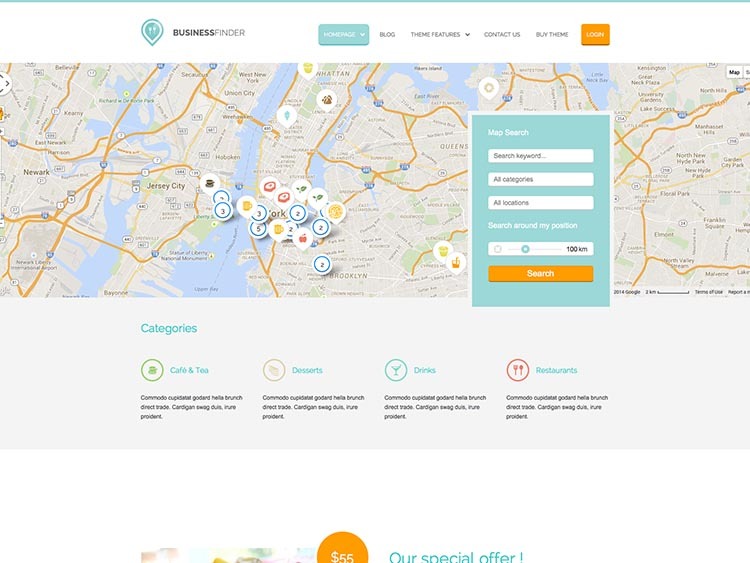 We have a feeling that this is the best selling WordPress business directory theme of all time, with nearly 9000 sales and no signs of slowing. As always, this often speaks as much to the quality of the development and support teams as anything, and you can count on lots of help with this one if you get lost. You can also expect to see frequent updates for some time to come, which might not be the case with less popular themes. This one pretty much set the standard for features, and the only reason it’s not higher on the list is that the design, though lovely, is beginning to feel a bit dated. Front-end administration, geolocation and Google Maps integration, advanced AJAX searching and a connection to PayPal are all here. Directory Portal is bundled with Revolution Slider. It’s also translation ready and offers a variety of customization and tweakable options on the back-end for users who just can’t leave well enough alone. 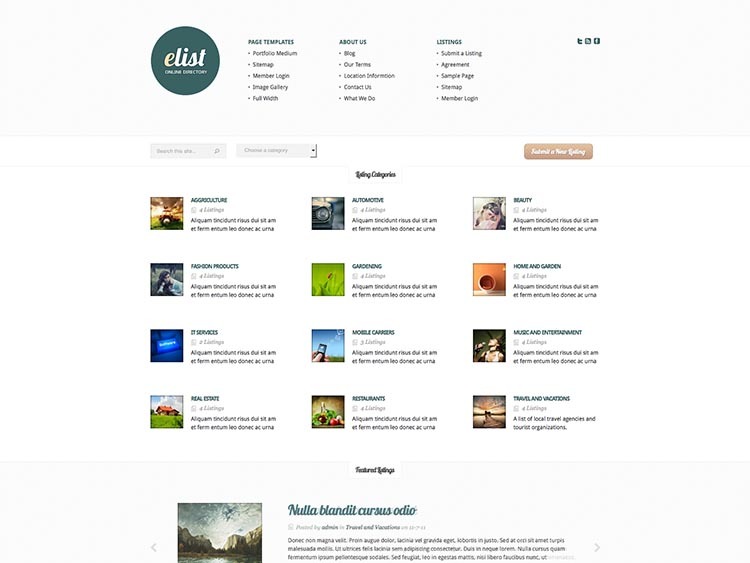 Finally, that brings us to eList, another ElegantThemes selection. This one’s pretty basic, but that’s its strength. Sometimes you just want to put together a simple city guide or directory, and can’t be bothered fussing with maps and geolocation and all that. Really, this does everything a theme ought to do to begin with: it looks good. If none of these themes fit your requirements, you’ll find that you can go custom for much less than you think. You can get a custom built directory site for as little as $100 from this top rated seller on Fiverr. Some examples of what you can get: a membership directory, a business finder, and a portal. Even if you have a theme, you can have your site customized exactly as you want — for as little as $5 — by a top Fiverr developer. Check it out here. And that’s the end of our round-up of the best WordPress business directory themes. Have a suggestion or an opinion or something? By all means, share it in the comments below! did you actually test the themes or you are just recommending them purely from an aesthetic point of view? Because I just finished reading a post on another website were they exposed severe XSS vulnerabilities in DirectoryEngine and 2 other themes they tested. I want to create a directory for moving companies. I am looking for a theme that allows me to have two types of login: service providers, and users looking for a moving service. And I want it to allow services to have “From” and “To” and handle the complexities that comes with that. For example: Search by destination or start, Calculate price by length of path, etc. What do you recommend? 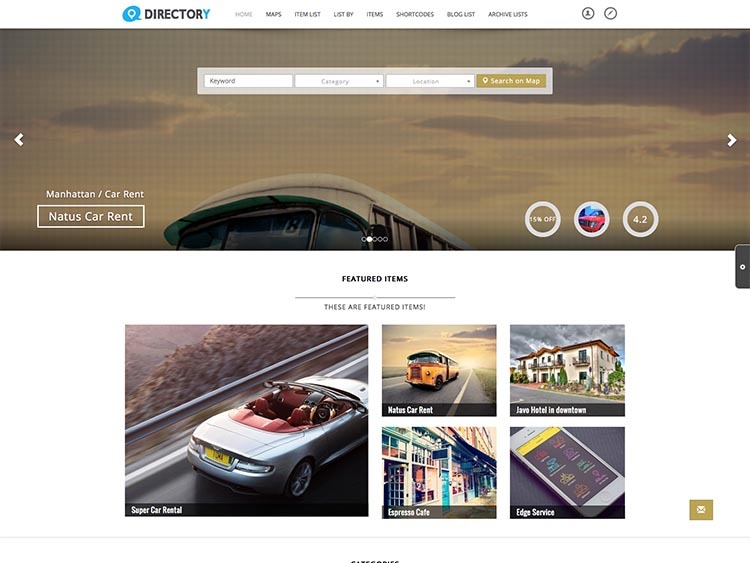 DirectoryEngine seems to be a good choice to create a new directory website instantly. I found one. Its called directory and you can find in the theme directory. But Im thinking to build my own, anyone have any advice? I just bought one of the PremiumPress directory themes and its full of bugs. Can’t make a text logo show up, I clear fields, save, and the fields repopulate with the fields I just cleared. Getting my money back and going with something else. i am looking at glocal as a candidate theme. can you please give me some business websites using this particular theme. i’d like to see how the site owners used the features of this theme.